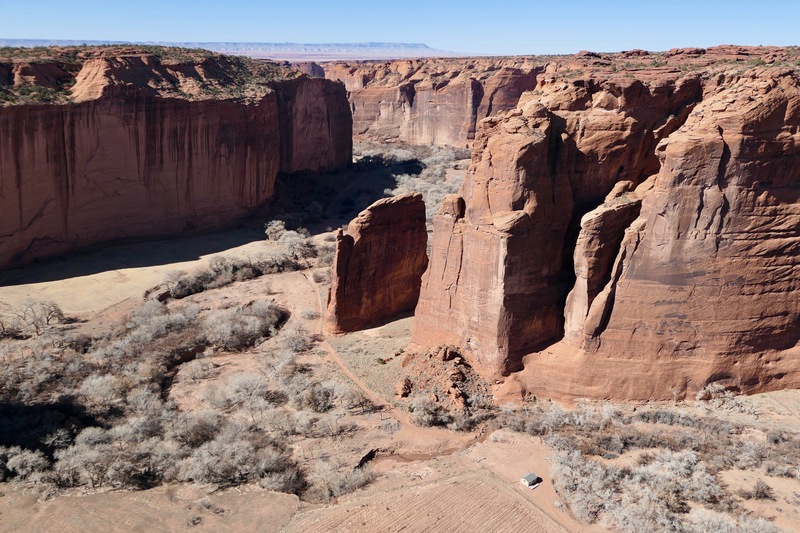 Instead, the river cut through the rock at Canyon de Chelly (duh-SHAY) National Monument, gouging deep channels over millions of years. The national monument is composed of three deep, winding canyons that hide over seven-hundred prehistoric ruins. Ancestral Puebloans built them between about 350 and 1300 CE. The area’s current residents, the Navajo, arrived around 1700. The monument is owned and cooperatively managed by the Navajo Nation, the only such arrangement in the United States. Navajo Nation, at twenty-seven thousand square miles, is about the size of West Virginia. Most of it lies within northeast Arizona. With over three-hundred-thousand members, the Navajo are the second largest tribe in the United States. 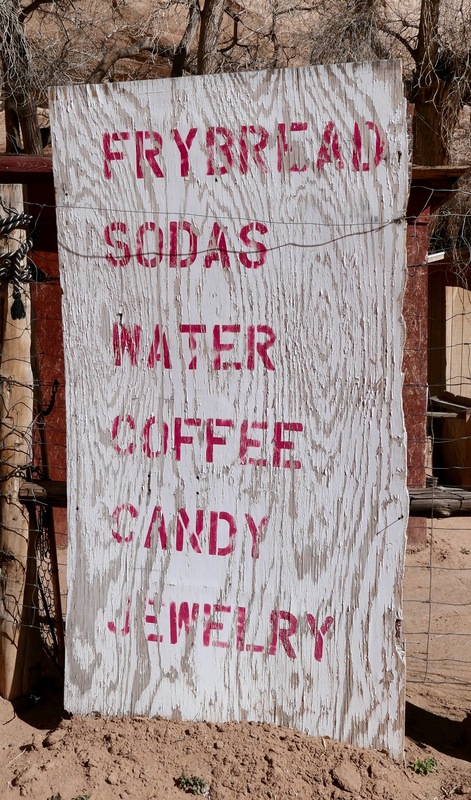 The Navajo language is spoken throughout the region. Inside the park, I checked into Thunderbird Lodge and then drove the south rim of Canyon de Chelly. Thirty-seven miles, round-trip. From the overlooks, I spotted Navajo farmhouses on the canyon floors and Ancestral Puebloan ruins tucked into crevices on the far walls. The valley floors are sandy with small creeks winding among the cottonwood and willow trees. I watched tour groups in all-wheel-drive vehicles splashing through streams a thousand feet below. 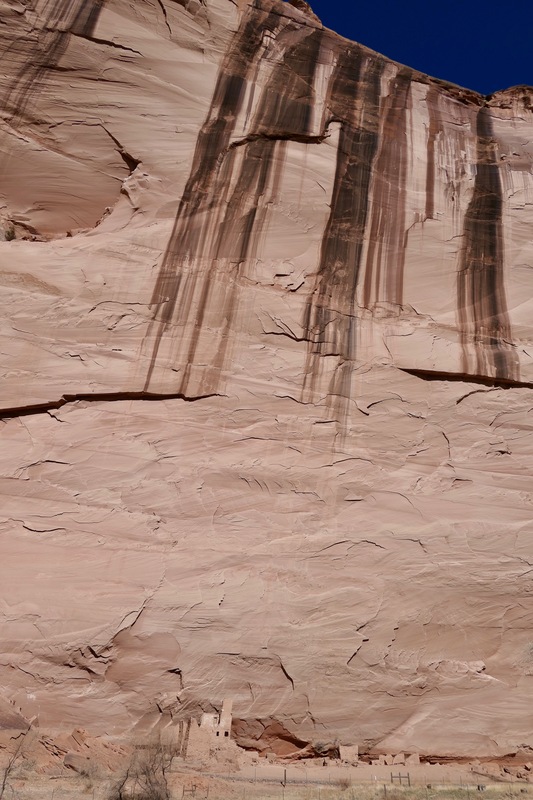 The sheer sandstone cliffs have weathered in layers, leaving soft, swirled edges. The reds, yellows and oranges are muted. Dark streaks of desert varnish drip down the walls. Fissures in the rock provide cover for ancient stone dwellings, which are often hard to discern. Access to the canyon floors is restricted. 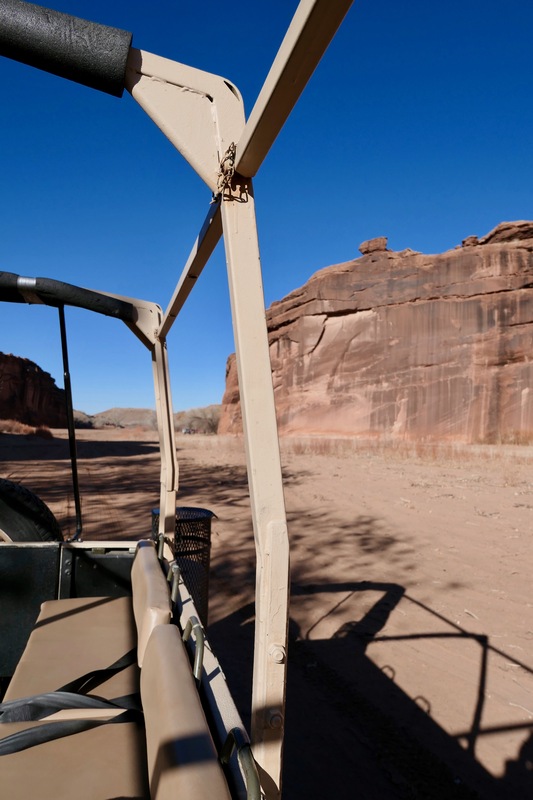 Visitors may only enter when accompanied by park rangers or authorized Navajo guides. The only exception to this rule is the White House Ruin Trail. I hiked to White House, six-hundred feet from the rim to the floor. The trail includes three long unguarded ledges, which were, frankly, a little scary to navigate. I clung to the walls, inching along slowly. At the bottom I crossed Chinle Wash and walked through ankle-deep sand to the ruin. White House is a one-thousand-year-old stone complex, built as two sections. Some of its rooms are grouped at the base of the cliff and others perch in an alcove fifty-feet above. The lower ruin once had around sixty rooms; the upper, twenty. At least fifty people called it home. A fence prevents visitors from climbing into the dwellings. Back on the road, I continued my driving tour. An overlook near the end provides a view of the park’s signature formation, Spider Rock. 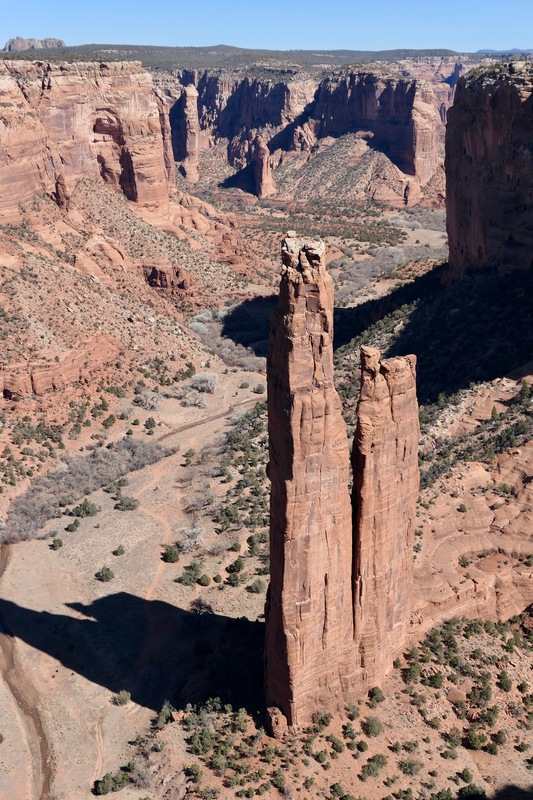 The sandstone spire stands eight-hundred-feet high at the junction of Canyon de Chelly and Monument Canyon. It has been the setting for numerous TV commercials. 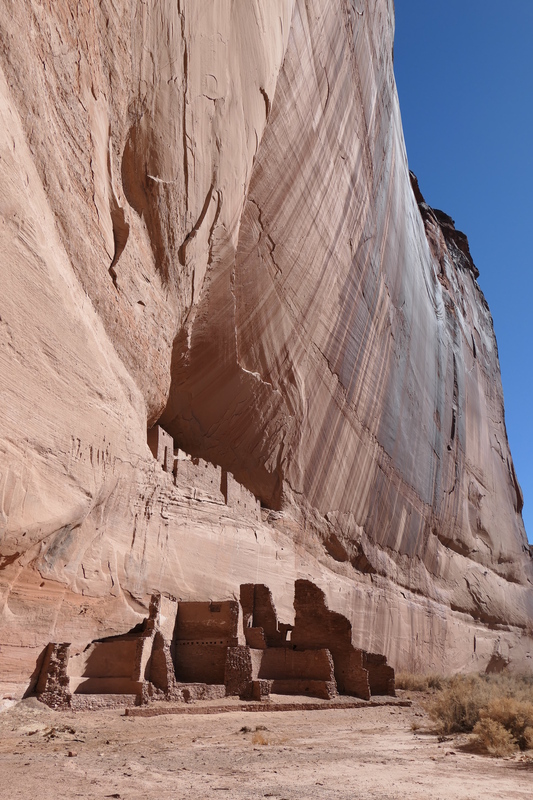 The obelisk is named for a Navajo deity, Spider Woman, who taught the Navajo how to weave. According to legend, the top of Spider Rock, where Spider Woman lives, is white with the sun-bleached bones of naughty Navajo children. In the afternoon, I drove the north rim of Canyon del Muerto, thirty-four miles round-trip. Navajo vendors, usually one per overlook, spread jewelry and pottery on their car hoods. They are friendly and polite, a pleasant change from the aggressive street hawkers elsewhere in the world. White House is promoted as the crown jewel of the park, but it is only the most accessible. Antelope House, Mummy Cave and other ruins, as seen from the overlooks, are every bit as impressive. Next morning, I checked in with the Navajo woman at the trading post who sold the canyon-tour ticket to me. “Where’s your wife?” she asked. Our Navajo guide’s Spanish name is Orlando. His Native American name, he said, is Stands With Fist. Orlando turned out to be a bit of a comedian, so maybe he borrowed the name from Dances with Wolves. Our small group of three climbed into the back of an open-air 1973 military-surplus Pinzgauer troop carrier, built in Austria. It had six-wheel drive, useful for plowing through deep sand and rocky washes. The temperature was in the twenties, so Orlando gave us blankets. We entered the canyon in bright sunshine. Almost immediately, Orlando stopped to point out mountain lion tracks in the mud. Approximately forty Navajo families live inside the park, most on the rims. Their farmhouses in the canyons have no running water or electricity. When the farmers work in the canyons, they must haul potable water, firewood and propane through the creek beds to their dwellings. We passed dozens of prehistoric sites, most sitting high upon ledges or in caves. Many more were likely hidden from view. 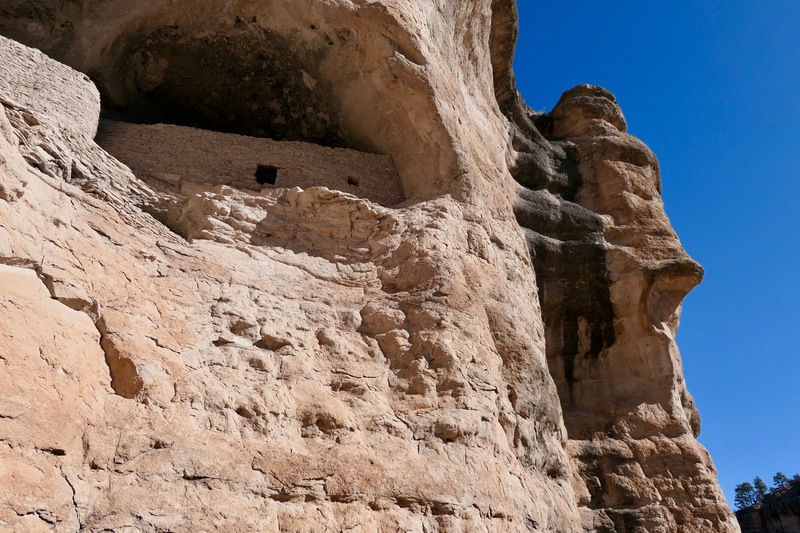 Orlando said five- to six-thousand Ancestral Puebloans once lived in the canyons. At each set of ruins and petroglyphs Orlando stopped to explain their significance. 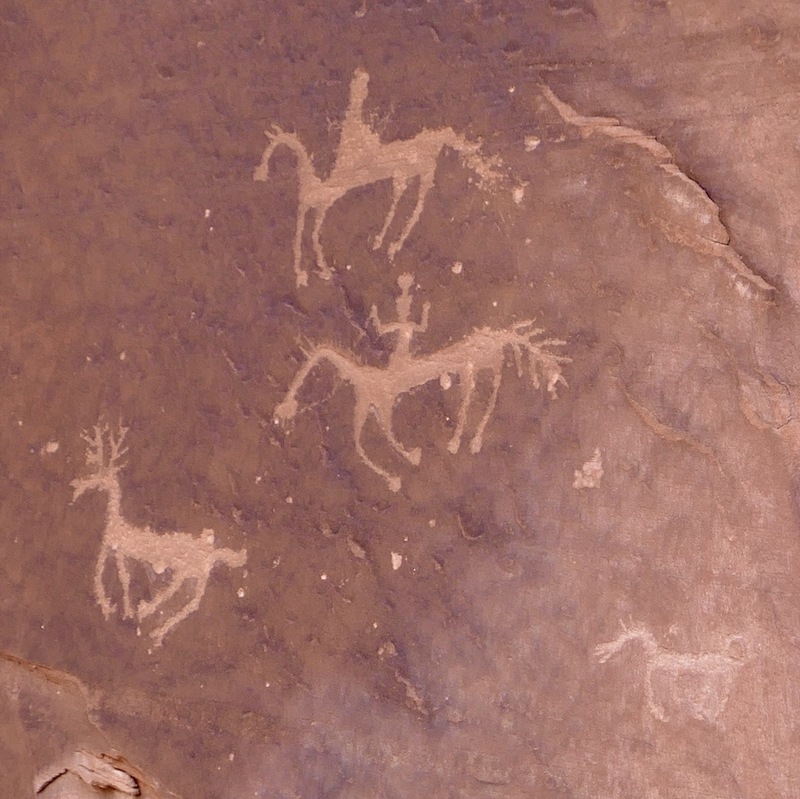 At Petroglyph Rock he pointed out the pictograph of men on horseback hunting a deer. The image could not have been created much before the early 1500s, as it was then that the Spanish introduced horses to the Southwest. We visited Antelope House, once as tall as four stories and composed of over ninety rooms. The walls above the ruin are decorated with large colorful pictographs of deer. Near the site, a row of Navajo vendors listened closely to a radio broadcast of a high-school basketball game. Navajo Nation had two teams in Arizona’s state tourney. I told him I had expected a more spiritual legend, something involving First Woman and Coyote perhaps. “My grandfather liked to tell jokes,” he chortled. We talked about the steepness of the canyon trails, the ones only accessible when accompanied by an authorized Navajo guide. Orlando embraced the expanse of rock with open arms. In the summer of 1873, a family of four moved to the rough-and-tumble mining town of Silver City, New Mexico. William, the stepfather, spent his time away from home prospecting and gambling. Catherine, his wife, was left behind to provide for her two sons. A year later Catherine died of tuberculosis. She was the mother of Billy the Kid. Her two sons were placed in separate foster homes, where they were expected to work to earn their room and board. In 1875, the fourteen-year-old Kid committed his first crime. He stole and fenced a quantity of butter. The county sheriff, Harvey Whitehall, let him go with a warning. Ten days later, an acquaintance of the Kid’s, George Schaefer (also known as Sombrero Jack), robbed a laundry, stealing two pistols and a bundle of clothes. He gave the clothes to the Kid, who hid them in his room. His foster-mother found them. This time Whitehall arrested him, the first lawman to do so. Two days later the Kid escaped through the jail’s chimney and became a fugitive. Within seven years he would be shot dead by Pat Garrett, after killing as many as nine men and perhaps more. 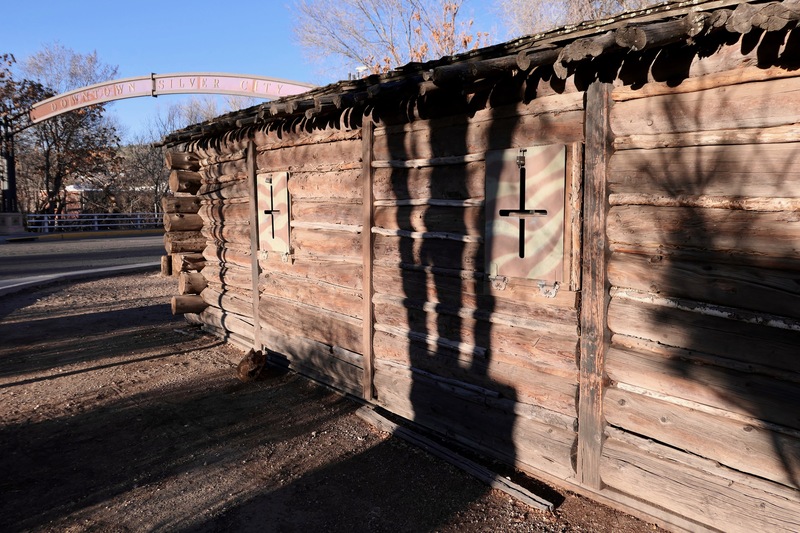 The site of Billy the Kid’s home in Silver City is marked with an 1870s-style log cabin, donated by producer Ron Howard, after he filmed the 2003 western, The Missing. The movie, starring Tommy Lee Jones and Cate Blanchett, is notable for its authentic use of the Apache language. The Kid’s mother is buried in Silver City’s Memory Lane Cemetery. In those days, off-road vehicles had to make ten river crossings to get to the isolated site. Today, the excursion requires a two-hour white-knuckle drive on a steep winding road without guard rails. 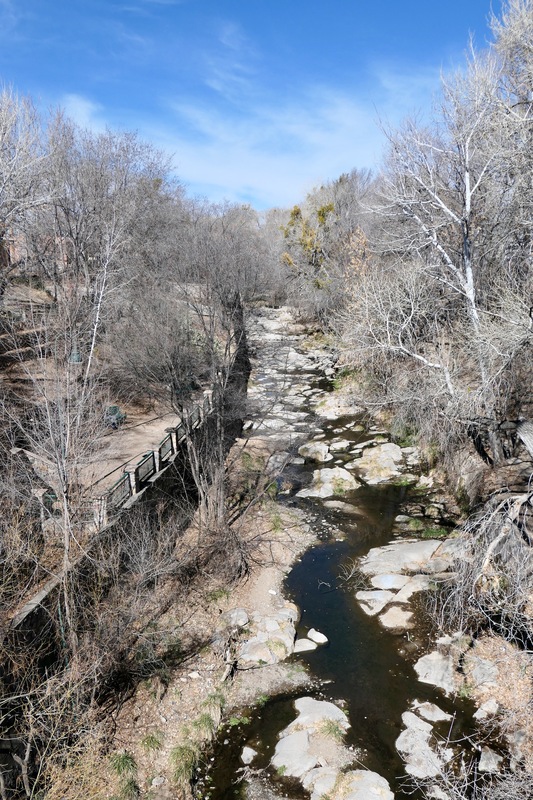 Much of the trip is through the Gila National Forest, a rugged five-thousand-square-mile wilderness with two-mile high peaks and several hot springs. The area is a natural playground for black bears, mountain lions and fearless backpackers. On a sunny Sunday morning with little traffic, I drove from Silver City into the park to visit the cliff dwellings. The trail to the ruins follows a stream into a canyon and then a steep, rocky slope along the face of a cliff. For thousands of years, early nomadic people sheltered in the caves of the Gila River. 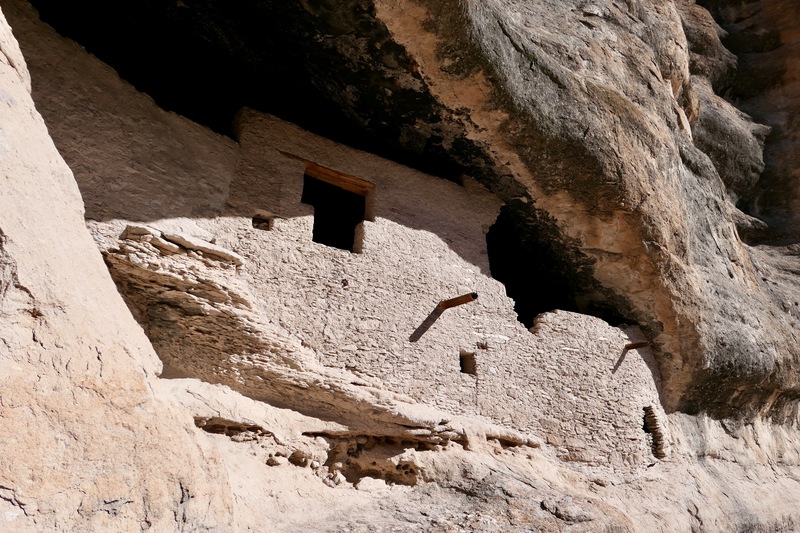 The Mogollon, one of three cultures of ancient indigenous peoples, used rocks and mortar to build rooms in the caves. They hunted, gathered and grew crops. Archaeologists have determined that the wood used in the roofs was cut between 1276 and 1287. Up to sixty people once lived in the forty-six rooms arranged within the caves I visited. Soot from centuries-old cook fires blackened the ceilings. In one room, seven-hundred-year-old corn cobs lay scattered on the floor. 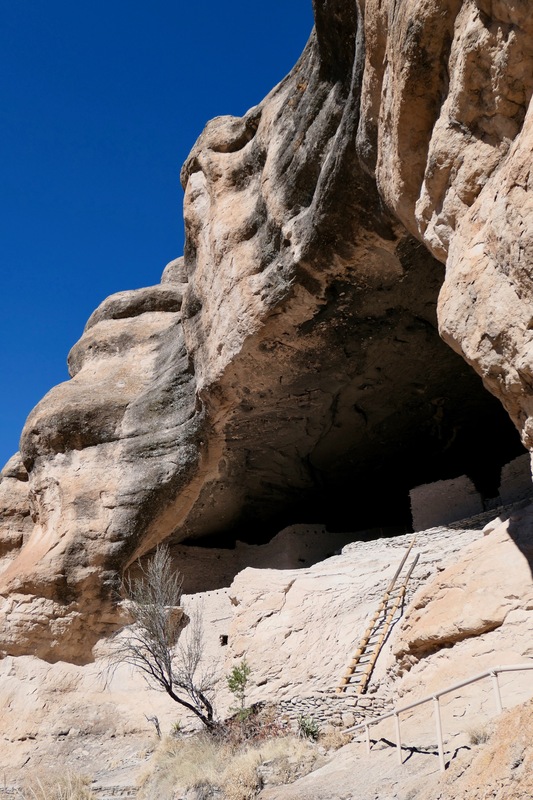 Items found in the caves indicate the Ancestral Puebloans traded for goods with tribes from Mexico and Central America. The site was first visited by European-Americans in 1878 and was looted and vandalized numerous times thereafter. In 1829, Geronimo, a leader of the Chiricahua Apache, was born nearby. His band of fierce warriors was one of the last to surrender to the US Army. From Silver City, I headed north on back roads to Grants, passing through the western edge of the Gila Wilderness. The majestic Mogollon Mountains erupt from the basin. A couple of them top out near eleven-thousand feet. The bare branches of the cottonwood trees along the San Francisco River gleamed white. I crossed the Continental Divide and climbed to the high desert of the North Plains. 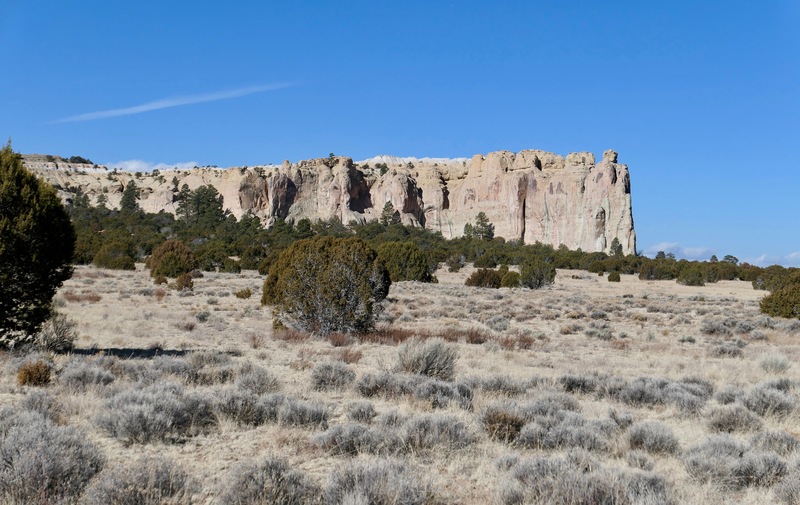 Then, around the east side of El Malpais (el-mal-pie-EES) National Monument, the landscape grows desolate and dark. El Malpais is Spanish for the badlands, appropriate given the barren volcanic field that covers most of the park. So desolate is the area, the Manhattan Project considered it as the site for testing the first atomic bomb. Native Americans forged a rough trail through the lava flow, but the Spanish bypassed it. Their horses’ hooves could not tolerate the razor-sharp surface. The two-hundred-square-mile park contains thirty extinct volcanos. The most recent eruption occurred within the last three-thousand years. The Zuni and Acoma pueblos mention “rivers of fire” in their oral histories, so perhaps their ancestors witnessed some of the eruptions. West of El Morro the rain turned to snow and produced a near whiteout. 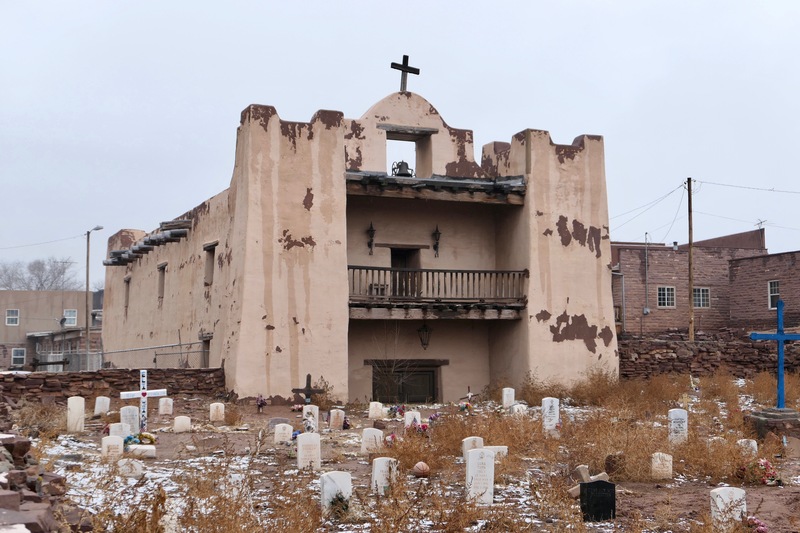 I followed the blinking lights of a snowplow for miles until I reached Zuni Pueblo. At the visitor center, Kenny, a Zuni archaeologist, shared what he was permitted to of the pueblo’s origin story, featuring Sun Father, Earth Mother and the twin brothers, the north and morning stars. He spoke passionately for nearly an hour, mixing myth and science, religion and evolution, archaeology and history. Kenny described the creation of the world, the advent of humanity, the development of Zuni clans, and the search for Middle Place. 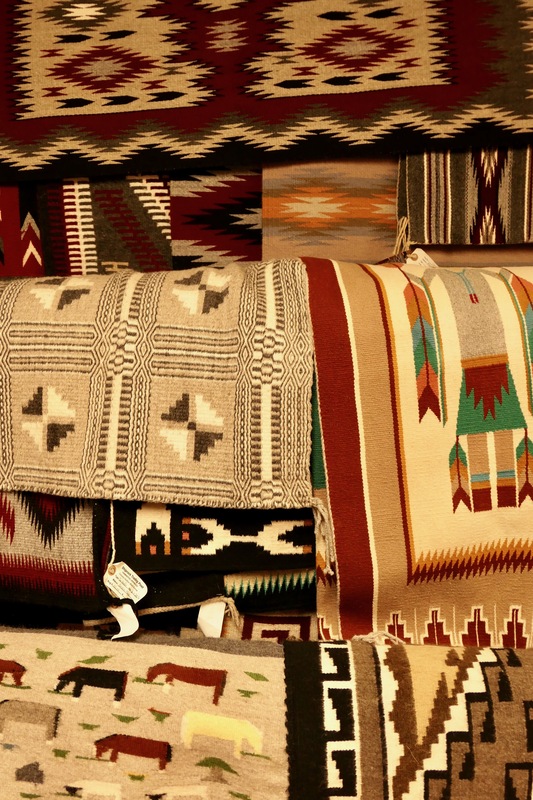 For the Zuni, Middle Place is home, where peace and stability are found. The Zuni have occupied western New Mexico and eastern Arizona for three- or four-thousand years. They speak a language unconnected to any other Native American language. Zuni is the largest of New Mexico’s nineteen pueblos with a population of eleven thousand. The Zuni first came into contact with Europeans in 1539, when four survivors of a failed Spanish expedition arrived. One of the four was Estevanico, a Spanish slave from north Africa, the first African the Native Americans had ever seen. A year later, famed conquistador Francisco Vázquez de Coronado paid the Zuni a hostile visit. Soon, many Spanish explorers, missionaries and colonists arrived. In the 1700s and 1800s, the Apache and Navajo regularly terrorized the Zuni. After his colorful lecture, Kenny led a tour of the traditional pueblo, Halona Idiwan’a, built at Middle Place. The day was dark and cold. The snow squall had moved on, leaving fog behind. The mud-red streets of the village ran with water. The adobe homes are small, many of them updated and sprouting satellite dishes. Instead of grills, round adobe ovens stand at the ready. Stray dogs followed our tour. After a while, I realized that the invisible connection between the separate above-ground dwellings is underfoot. A traditional pueblo building is composed of adobe rooms stacked up to five stories tall around a central courtyard. Usually each floor is stepped back from the floor below, pyramid-style. The roof of each level serves as terrace for the level above. At Zuni Pueblo only the top couple of levels are visible. The rest of the rooms are underground, buried in centuries of dust. Kenny said most of the homes on the surface have openings in their floors that lead to empty chambers below. He has explored as deep as four levels. In 1864, the remaining Navajo were forced to march over three-hundred miles to Fort Sumner. Many died of thirst, hunger and fatigue on “The Long Walk.” More died while incarcerated. It was ethnic cleansing, American-style. In 1868, those who survived were allowed to return home. They found their hogans burned, their sheep killed and their fields destroyed. Ten years later, John Lorenzo Hubbell purchased a trading post in the Ganado area of Arizona. He had learned the Navajo language while working as an interpreter for the US Army. As the Navajo attempted to rebuild their lives, Hubbell’s post became a vital economic and social center. He supplied flour, sugar, coffee, canned goods, tobacco, tools and cloth in exchange for wool, sheep, rugs, jewelry, pottery and baskets. Goods were exchanged without cash. Hubbell steered the Navajo toward the crafting of goods most likely to generate a profit and, in so doing, helped them become economically self-sufficient. 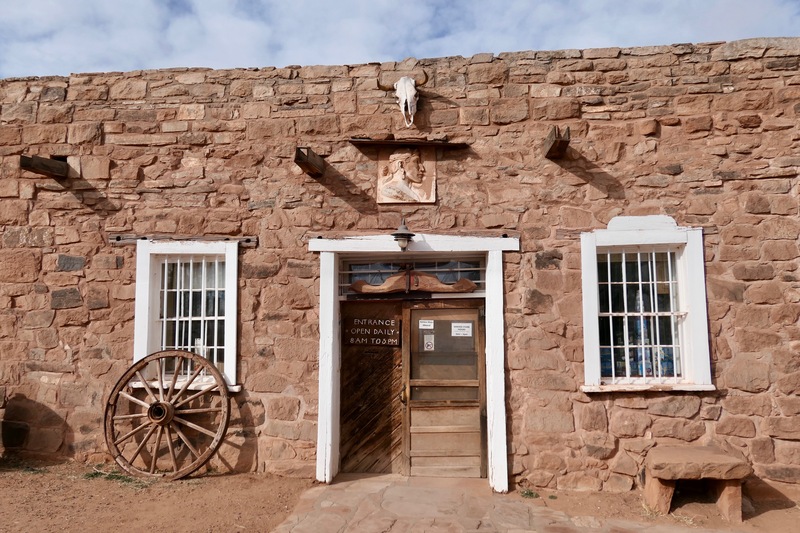 The trading post has been operated continuously since 1878, first by the Hubbell family and now by the National Park Service. My guide for the Hubbell Trading Post National Historic Site was a Navajo woman named Ailema (Amelia, her mother’s name, spelled backwards). She was born in Ganado and had memories of visiting the post as a young girl when it was still operated by the Hubbell family. 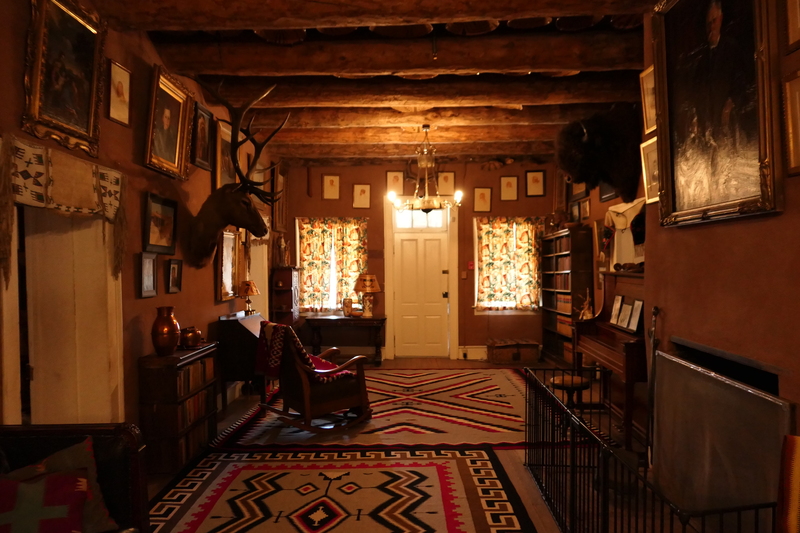 The Hubbell home was grander inside than I expected, with high ceilings, a large stone fireplace, Navajo rugs and western-themed paintings. Hubbell’s collection of Native American baskets is displayed on the ceiling. Hubbell was respected by the Navajo for his fairness and support. He is buried next to the trading post, perhaps the only Anglo-American buried on Navajo land. 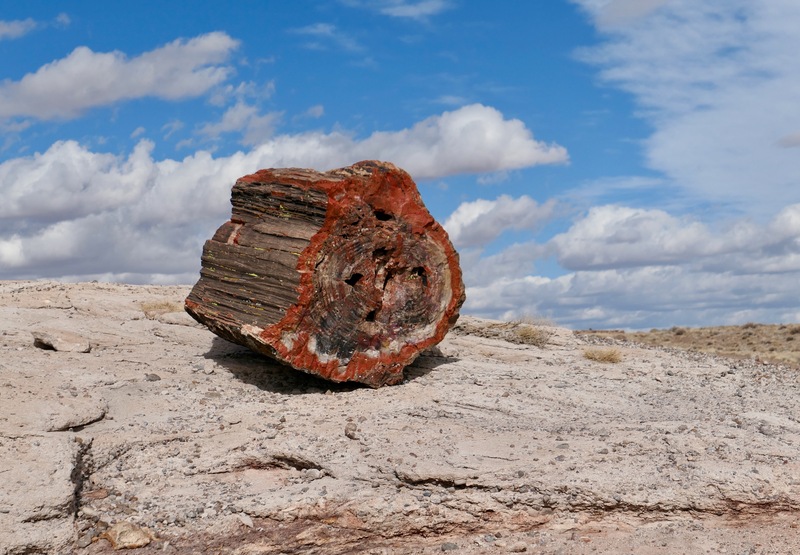 The “trees” in Petrified Forest National Park were alive when the dinosaurs roamed. They died around 225 million years ago. Now they are fossilized logs, scattered among 230 square miles of desert. Some are huge, as thick as ten feet and as long as two-hundred. Most are stumpy cross sections. Over the millennia, water seeped into the logs’ cells, leaving behind crystallized quartz. Minerals in the quartz produced glittery reds, blues and greens, inspiring the name rainbow wood. Ancient hunters fashioned arrowheads from petrified wood. Ancestral Puebloans built dwellings with it. More recently, souvenir hunters have stolen thousands of tons of it. The north end of the national park overlooks the Painted Desert, known for its colorful badlands. I stopped at the Painted Desert Inn to admire the view. Built partly with petrified wood, the inn opened in the 1920s as a tourist attraction. In the 1940s and 1950s, it was an oasis for Route 66 travelers. 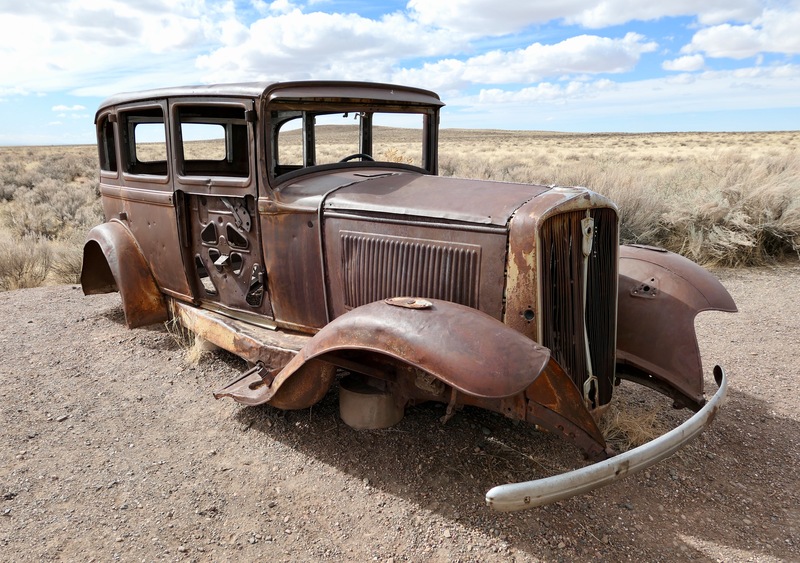 Today, a rusty 1932 Studebaker marks the spot on the roadbed where Route 66 once ran through the park. 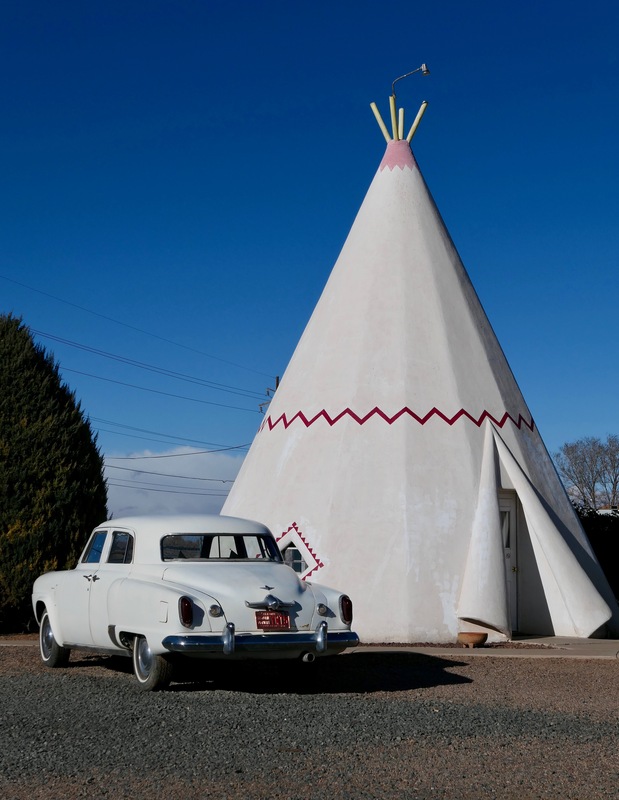 The streets of nearby Holbrook are lined with additional remnants of Route 66’s heyday, such as the kitschy Wigwam Motel and its concrete tepee-rooms. 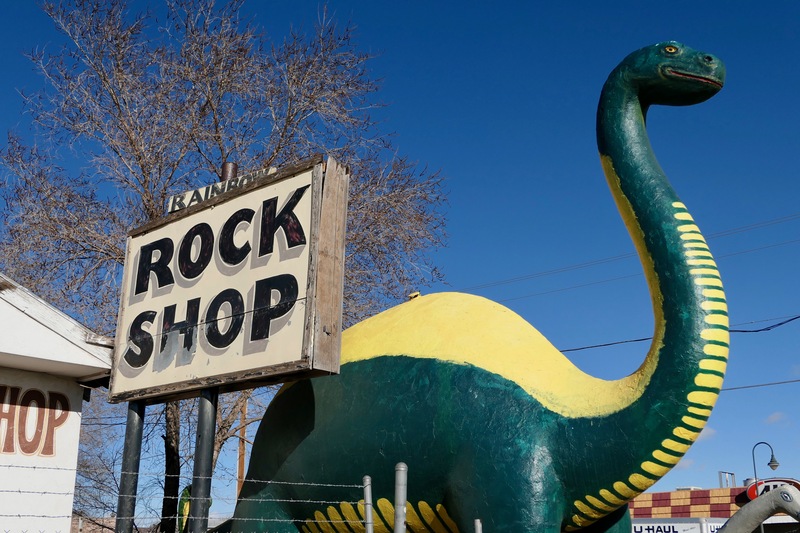 Statues of dinosaurs guard piles of petrified wood in front of the numerous rock shops. I visited Jim Gray’s, a sort of Walmart of fossils and minerals, both natural and polished. Inside are jewelry, tabletops, bookends, clocks, chess pieces and so on, much of it made of petrified wood. In the yard are piles of raw minerals and rows of petrified tree-trunk sections. Gray’s excavates, manufactures and ships rainbow-wood products internationally. Overnight, dozens of tumbleweeds had gathered in a corner of the hotel’s parking lot. The wind howled at a sustained speed greater than forty miles per hour all day. My weather app indicated gusts up to sixty-three. The strong winds produced a continuous dust storm. The horizon was blurred in every direction. Opening the car door against the blast was difficult, closing it dangerous. I stopped at Puerco Pueblo, where as many as two-hundred Ancestral Puebloans lived in a one-hundred-room complex around 1300. Petrified Forest contains more than six-hundred archeological sites. 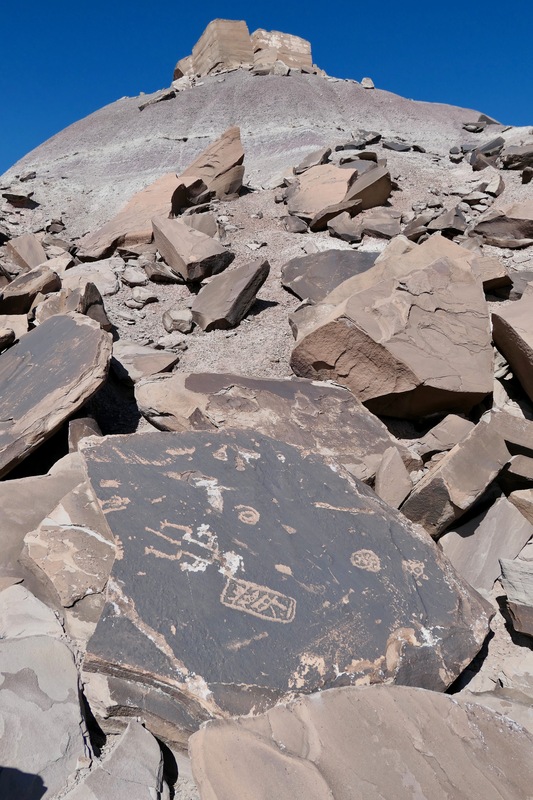 One of these is Newspaper Rock, which is neither a newspaper nor a single rock. At the site over 650 petroglyphs are pecked into several rock faces. Some are over two-thousand years old. The symbols include humans, animals, spirit shapes, animal tracks, hand prints and geometric abstractions. At the south end of the park, I hiked the Long Logs and Agate House trails. Moving against the wind was difficult, occasionally stopping me in my tracks and sandblasting my face. The roar was continuous. The landscape at Long Logs looks like the aftermath of a lumberjack chainsaw competition with cross sections of tree trunks scattered everywhere. The Agate House pueblo was reconstructed in the 1930s using its original petrified-wood bricks. 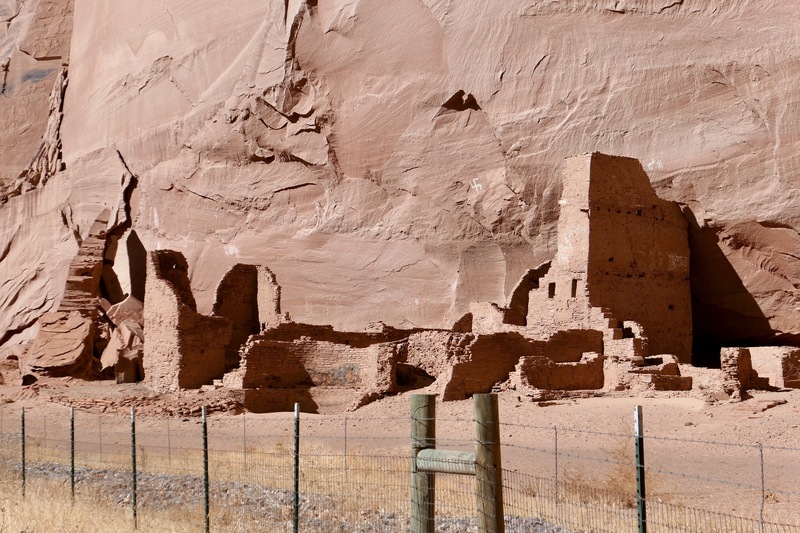 Originally, it was built and occupied by Ancestral Puebloans between 1050 and 1300. The trail started in a dry wash and then cut cross-country toward the butte. Animal footprints of multiple species were evident in the creek bed. At the base of the formation are several prominent petroglyphs. I was excited to have them to myself, up-close and personal. At Blue Mesa, a colorful badlands of tepee-shaped formations, I attempted to hike the trail, but the ridges were too difficult to navigate in the gusting wind. I thought I might be blown over the edge. I drove back to Holbrook, my eyes, nose and ears filled with sand. The wind buffeted the car. 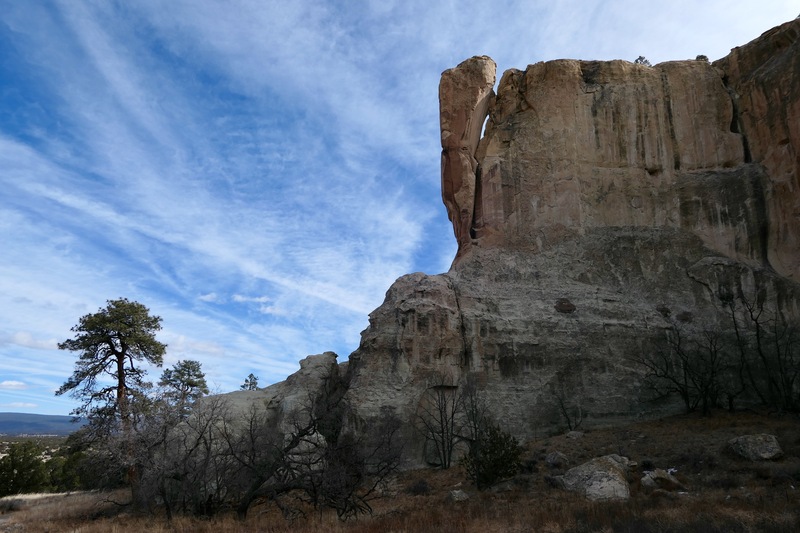 In northwestern New Mexico stands an imposing sandstone bluff, upon which seven-hundred years of history have been written. 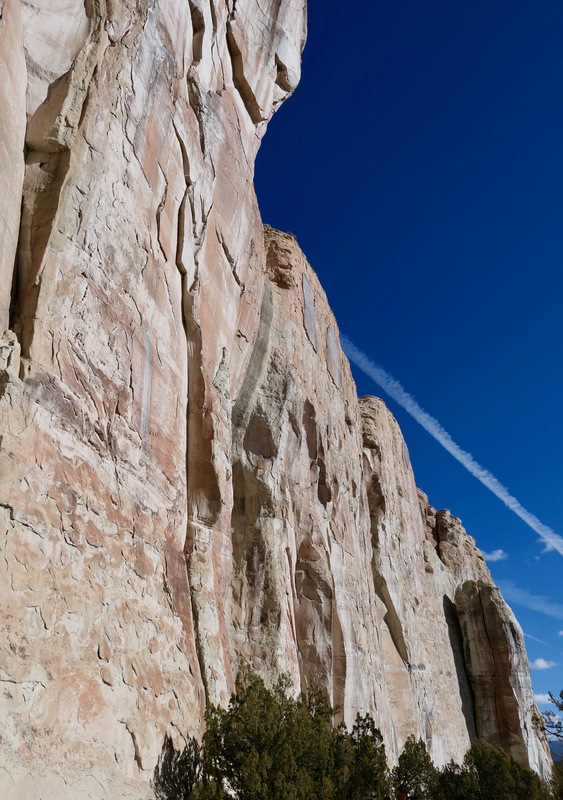 The smooth vertical walls of the mesa, called El Morro, served as a kind of guest registry for thousands of visitors who couldn’t resist a blank canvas. The attraction was not the wall, however, but the natural pool of fresh water at its base. El Morro was an oasis in the desert. The first to chip their symbols onto the walls were the Ancestral Puebloans, up to one-thousand years ago. They were so attracted to the water supply and its defensible position that they built a village on top of the bluff around 1275. Until its abandonment around 1400, the pueblo housed up to fifteen-hundred people in 875 interconnected rooms. A couple of decades later, along came the Spanish. The first to visit was Antonio de Espejo in 1583, thirty-seven years before the Pilgrims landed on their rock. He left his name on the wall. In search of gold, other conquistadors bivouacked at the oasis, calling it El Estanque del Peñol (the pool by the great rock). They autographed the walls with the inscription pasó por aqua (passed by here). Eventually, the Spanish were driven out and the Americans arrived. Settlers and soldiers visited El Morro as the new nation expanded westward. The pioneers, including children like twelve-year-old Sallie Fox, stopped to rest and scratched their names into the stone. Over two-thousand inscriptions are recorded in the cliff faces–petroglyphs, signatures, dates, images, even poetry. The modern-day descendants of the Puebloans, the Zuni, call the site A’ts’ina (place of writings on the rock). Anglo-Americans call it Inscription Rock. In the morning, I scraped the ice from the windows of my rental car with a credit card and, like thousands of travelers before me, headed to El Morro. I walked the trail, starting at the rock basin, the size of a backyard swimming pool, and following the bottom of the cliffs along the side of the promontory. The rock face glowed white in the sun. At intervals I paused to study the inscriptions. Around the corner the climb began, up two-hundred feet to the top of the bluff using a switchback trail. The mesa was breezy but quiet. I was the only person there. The edge lines of the trail had been etched into the surface of the tuff. Nearby, the ancient pueblo’s walls are partially excavated. I gazed down into the box canyon, which had been used for centuries to corner game and corral cattle and horses. The earlier visitors to the headland, the Ancient Puebloans, conquistadors, pioneers and railroad men, are long gone. The signatures they left behind seem timeless in the present moment. Yet they too are fading into history, disappearing slowly as the rocks are worn away. Long, long time since I spent time in de Chelly, Kirk. So long, in fact, that there were no visible rangers or guides. We just wended our own way as we wished. I remember seeing a much later movie shot there where in fine technical movie making, Spider Rock came tumbling down. You should publish this, Kirk. I enjoy the info and your style so much! Keep traveling! I really want to visit so many of the places you’ve visited, photographed, and written about. You bring them all to life Kirk, thank you! Thanks, Peter. I feel the same about some of your destinations. New Zealand, for instance.